Chris Wood’s 23rd goal of the season earned Leeds United a valuable three points from a hard fought Yorkshire derby against Sheffield Wednesday. The New Zealand centre forward’s 24th minute strike was United’s only effort on target, but Wednesday only had one on target as well when Jordan Rhodes saw his second half penalty saved by home keeper Rob Green. In windy conditions it was not easy for the players to get the ball down and play and the sides cancelled each other out for much of the first half. 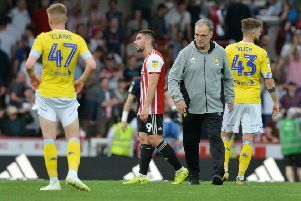 After the break the visitors had much of the pressure without creating any real openings apart from the one handed to them by referee Michael Jones just three minutes after he had denied Leeds a spot kick for what looked an obvious foul on Eunan O’Kane. The referee appeared to want to be centre of attention as he failed to account for the conditions and gave far too many free-kicks. As a result there was no real flow to the game, but the Whites will not mind in the end as they got the points to go three ahead of Wednesday and go back up into fourth place, for a few hours at least. Leeds had the first effort on two minutes as Wood scuffed his angled shot from the edge of the box and the ball went harmlessly wide. But it was soon evident it was a bit of a stalemate with Wednesday’s first attacks of note bringing a Vincent Sasso near post flick wide and a turn and shot over from Rhodes. Out of the blue United scored when Sasso failed to get his head to Gaetano Berardi’s cross and the ball fell nicely for Wood, who controlled the ball and calmly scored from close range. There was little more goalmouth action for the rest of the half, although Fernando Forestieri sent a chip over from just inside the box. The second half started with Wood latching onto Liam Bridcutt’s long ball only to shoot wide from the edge of the box. O’Kane then went down in the box under a clumsy challenge from Sam Hutchinson but no penalty was given. To the home fans anger the visitors were given their penalty on 53 minutes as Souleymane Doukara seemed to bundle Hutchinson over in a slow motion challenge from a corner that had needlessly been given away by Luke Ayling. But Green guessed the right way from Rhodes’ spot kick and kept the ball out, the follow-up shot was blocked and the resulting corner headed over by Forestieri. Glen Loovens headed another corner over as the Owls threatened further, but Leeds stgood strong in defence for the remainder to get another home clean sheet. The only other Wednesday effort in fact was a Barry Bannan 25-yarder that went just wide while United had several opportunities on the break which they did not make the most of with wrong options taken. O’Kane’s shot almost turned into a pass for Wood, but the striker could not flick the ball in and Hernandez saw a shot deflected wide after a dangerous cross had just been cut out. But despite lots of energy being used up there were no chances in the final 10 minutes and the game was seen out as a 1-0 win for Leeds who were able to celebrate their first double over the Owls for 17 years. He said: “I thought it was a fascinating game and a very good game. “I was pleased that we managed our game plan well defensively and offensively. We were the team pushing in the first half and got a goal. It was to be expected they would come back in the second half, but I thought we handled the pressure well and the only real chance they had was the penalty. “It was clear for us we should have got a penalty then to go at the other end and concede a soft we felt aggrieved. But it was a fantastic save from Greeny. “He didn’t have too much else to do throughout the game, but that was an important moment in the game. Leeds: Green, Ayling, Bartley, Jansson, Berardi, Bridcutt, O’Kane (Vieira 83), Sacko (Roofe 70), Hernandez (Dallas 86), Doukara, Wood.